This morning I went out and bought plants for the flower beds, had lunch and a nap, and then decided what I wanted to paint. 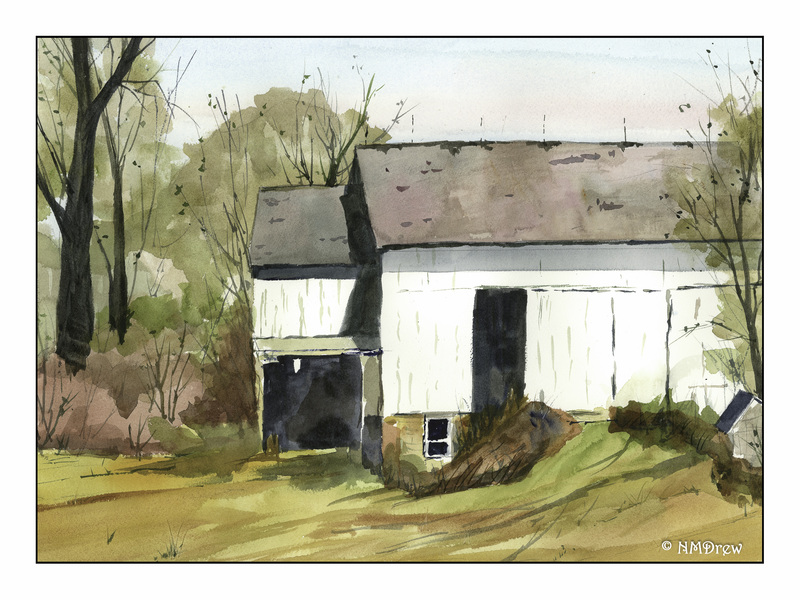 Rick Surowicz just posted a new video on his YouTube channel called “Waiting for Spring.” On his personal website, he posted a sketch of the study as well as a photograph of the actual barn, and his final watercolor. If you haven’t checked out his channel, you should. He has so much valuable information. When I am feeling more focused, I want to try out his two classes as they are more detailed than his YouTube presentations, although they are detailed enough for anyone who wants to learn. This video appealed to me for a number of reasons. One, perspective. This is a frontal view, so the roof line is pretty much a straight line across the top, parallel to the top edge of the paper. I got out my ruler and made both straight horizontal and vertical lines. From there, I roughed in the trees and shadows and bushes. The palette was pretty simple – Rick posts the colors he used at the beginning, as well as mentioned that his Cerulean Blue is PB36 as opposed to PB35 – PB35 apparently is more greenish than PB36. This would be either DaVinci Cerulean or Daniel Smith Cerulean Blue Chromium. Of course, if you don’t clean up your paints, you could have just about anything. What I learned from this video were a few things. One, mix colors on the paper as you move along. Specifically, on the roof, I moved from one color to the next, picking up paint and working it into the paint on the paper. This gave a nice effect. Another important thing was to realize that while I have flat brushes, most of mine, if not all, are rather stiff. Painting with them at times created problems as a softer flat brush would be a better choice in some areas. I also realized I need to sort out my brushes better – put rounds in one area, flats in another, and riggers and other specialized brushes in another. I have a stand, and perhaps I shall use that next, or else I may just get individual holders – like jars or tins – to hold specific brushes in specific areas. I continue to learn! As I look at this painting, I can see my confidence in handling color has come a long, long way. I plan to do a few more barns in the coming week, using photos from Pixabay. This way, I can practice perspective, use my ruler, and try to paint more confidently than I seem to do when I don’t have a video to follow. Today was another practice session using a study by Rick Surowicz on his YouTube channel. 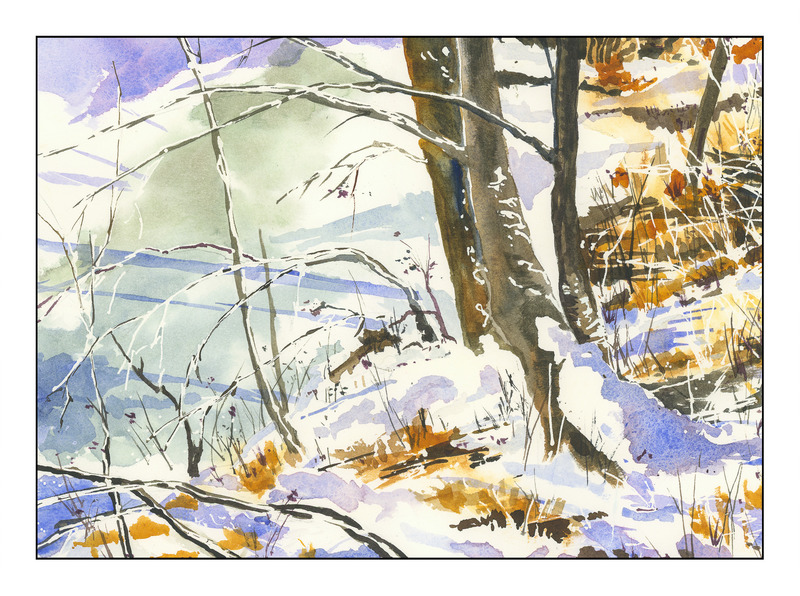 This one is titled “Snowy Creek’s Edge.” As with the one I did the other day, there is a lot of use of frisket, and this particular study with filled with it! Keeping areas white is important, and many watercolorists eschew using it – I know I sure did – but judiciously applied, it really does make painting easier. What I really liked is that it is an excellent way to express narrow bands of snow lying along slender branches and twigs. It also allows for creating negative space without painting tediously around things – a good skill to have, but at times not necessary. Coming away from this, I am getting less caught up in copying Rick’s painting and using it as a point of study in watercolor technique, blending colors, and usage of tools and brushes. Tomorrow (unless the family Thanksgiving becomes a bit much during the morning) I plan to find a snowy scene, either from a photo I have taken or from a public domain image, and work more with snow in the landscape.